Today our public school teachers are facing policies that disempower, divide, and punish them: firing teachers based on standardized test scores, concentrating underprepared teachers in disadvantaged communities, and refusing to give them the chance to grow as educators. Supports evaluation models that drive meaningful professional growth. 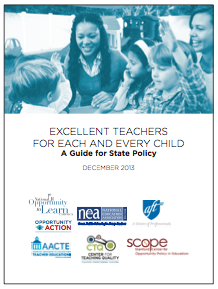 Our new policy guide, "Excellent Teachers for Each and Every Child," can get us there. It provides the legislative tools, but we need your help. Your governor and state legislators need to know that this issue is important to you. Tell your state lawmakers: don't punish teachers, support them!